In a Violent Way is a multimedia installation by Lawrence Matthews III that incorporates a wide array of visual and audio elements, from oil painting and collage to tube televisions and archival video footage. To accompany the installation, Matthews will perform his own original songs at the close of the show’s reception. The exhibition’s title is a nod to the seminal, genre- bending 1969 Miles Davis recording, In a Silent Way, which inspired and guided Matthews while he created this body of work. The imagery of the exhibition is sourced from or informed by mass media portrayals of events past and present in four primary cities: Baltimore, Los Angeles, St. Louis and Memphis, each with its own history of entrenched racial discrimination and economic disparity disproportionately affecting people of color. Mixed media works depicting the demonstrations and unrest of the 1960’s tellingly reside alongside banks of television sets showing video footage of more recent discord, like the 1992 L.A. Riots. These scenes — differing in timeline, though not in tenor — convey generations of frustration caused by institutionalized oppression, angry citizens crying out against abuses at the hands of authority, and the ambivalent eye of the media that only captures part of the story. 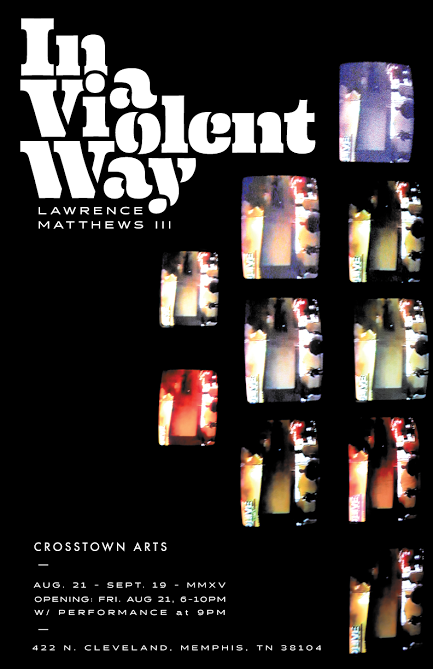 Lawrence Matthews III was born in Memphis, TN into a family who encouraged him to be an artist from a young age. He received his BFA from the University of Memphis and was awarded “Best of Show” in the University’s 31st Annual Juried Student Exhibition. Young but already prolific, Matthews is an emerging artist who has shown work in several solo and group shows across Memphis, including Doomed to Repeat at Circuitous Succession Gallery (2015), Cigar Box Show at Glitch Gallery (2014), and Price Is Right at David Lusk Gallery (2014). Matthews works in a wide variety of media, including oil paint, collage, photography, sculpture, music and film, and combines post-modern, Pop Art and contemporary influences to narrate his perspective as an African descendant living in America.